he Great Depression put brakes to the skyrocketing consumer culture of the 1920s and cut sales for all pen makers dramatically. Between 1929 and 1930, Parker's profits were cut in half. Many smaller companies disappeared altogether. By the end of the depression, the field was dominated by four companies, in order of size, Parker, Sheaffer, Waterman, and Eversharp. Despite hard times, the major companies did not halt innovation or cut advertising in the depression years. Those firms that survived the crash stepped up their efforts to sell pens that were new not only in style but in function. The greatest innovator in the 1930's was without doubt Parker, which rose to the leadership of the industry during the decade. Again, advertising and technology led the way, and once again the technological issue was filling systems. Parker always tried to look forward and anticipate the need of changes. In the middle of the 1920's, while still on the roll with the Duofolds, Parker knew that there would come a time when it had to be replaced with something new. For all it's simplicity and utility, the lever filler did not add to the beauty of any pen and on occasion levers could mistakenly be forced open, creating an ink-mess. For that reason, Parker never adopted the lever for their top quality pens, preferring to use a button enclosed by a blind cap at the barrel end to activate the pressure bar. Around 1925, a professor Dahlberg at the University of Wisconsin started working on a new filling system for fountain pens. Within two years he was granted a patent. He was however having trouble with the mechanical details and was also running out of money. He decided to offer the patent to Parker, and although the patent was far from marketable Parker were impressed and purchased the patent. arker then spent five years developing and perfecting the mechanism. They also hired a top designer, Joseph Platt from New York. He did design the Parker arrow - one of Parkers trade marks to this day, but he was also a consultant on the design for the complete pen. Parker then approached the company DuPont for supplying the plastic, they doubted that they could supply the celluloid with the striped pattern requested, but they succeeded in the end. Parker then applied for and was granted a design patent for the new plastic. The stripes are sometimes uneven, both horizontalwise and in colouring. Earlier Vacs were made out of solid rod stock. The reflectivity of the pearlescent material had to do with its orientation as the materal cured. Maximum pearlescence would thus be visible only from two sides and minimum 90 degrees off from that. Later Vacs were made from flat stock wrapped around a mandrel, so max pearlescence went all the way around. (1) Slender Junior, Grey Pearl Shadow Wave shown. (2) Sub Junior, aka Stub, Laminated Burgundy Pearl shown, also exist as ring-tops. (3) Junior. Burgundy Pearl Marble shown. (4) Slender, same size as the Slender Junior, but with three rings, Laminated Burgundy Pearl shown. (5) Standard. Laminated Emerald Pearl shown. (6) Senior. Longer than the Standard, but of the same width. Note the the cap bands, middle one being wider. Laminated Burgundy Pearl shown. (7) Oversize. The largest of the Lock-down Vacumatics. Laminated Golden Brown shown. Since the brown was inroduced late in the production span, it is the most uncommon colour of the Oversizes. (8) Standard fitted with a very broad solid gold or gold plated cap band. This model was manufactured in Canada and the broad band can be found on most sizes. arker in the end had spent $ 125,000 and five years developing the container and the new filling system. After several years of in-house development and styling Parker in 1932 quietly began test marketing the novelty pen. The pen was radical in several ways. Parker boasted the model to be the first self filler without a sac, which wasn't entirely true. However the filling mechanism was an innovation. By using a diaphragm rather than a sac, the whole barrel could be used as a reservoir. The principle workings was essentially like that of the earlier button fillers (Duofold) as the depression of the plunger pushed on the rubber sac and forced out the air (creating a vacuum) and when the rubber regained it's natural form the ink got sucked into the pen to replace the air. The outward difference was that the previous button was replaced with a fat (approximately 4 mm) plunger that was used to operate the diaphragm. The plunger could be locked in a down position with a twist of the thumb. (And is referred to as the Lock-Down Fill, or Twist-Fill). A short blind cap that sported a tassie ring and a "jewel" was also fitted, the two jewels (top and bottom) followed the pens colour and was also striped in the same manner. he new arrow was also fitted to the nib. 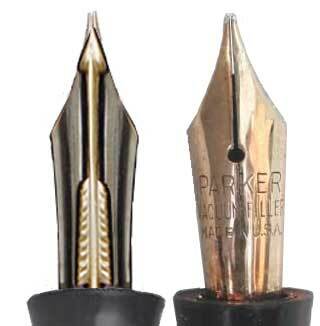 The Parker boasted 102% of the ink capacity of their rivals. Golden Arrow July 1932 — November 1932. The test marketing strategy had proven successful during the introduction of the Duofold and Parker quietly began distributing 60 hand made Golden Arrows in a store in Chicago. During the month of July 1932 the store had sold nine Wahls, seven Sheaffers, six Parkers, two Swans and one Waterman. Enter the Golden Arrow. The first week of August the store sold 15 Golden Arrows, one Parker Duofold and one Swan. Both the store owner and Parker were very impressed by this, and one week later Kenneth Parker went on a trip to instruct all the sales managers of the districts about the new Golden Arrow. He brought two samples to each salesmen and they could start taking orders immediately from the store owners. Of the samples one was a demonstrator, the other one a standard pen. The salesmen came back very excited, one in the Pacific Coast Region had sold 595 pens and 230 pencils, and called it "the end of the depression". By the first week of October a complete line of Golden Arrow samples was sent to each salesman with a request to return the first two items to the factory. Orders poured in but no pens were shipped until the end of October. The picture shows the Standard model. See below for model comparison. (1), (5) and (6), opaque versions, and (9) also come with the Vacuum Filler imprint. There are four different Black finishes. (2) The very rare transparent Standard Crystal, the Junior (2-ringed) version is much more common. Caps are not interchangeable. (5) Laminated Grey Pearl. There are both opaque and transparent versions of this finish. (6) Laminated Burgundy Pearl. There are both opaque and transparent versions of this finish. (7) Laminated Emerald Pearl. Transparent only. (8) Laminated Golden Brown Pearl. Transparent only. (9) "Ripley's". Laminated Burgundy Pearl. This was a very short production pen and the first transparent laminated Vacumatic filler. Items with the imprint "Vacumatic" are more uncommon. Note the black blind cap. (10) Candy Stripe in Burgundy. The Candy Striped Vacumatics were made in England from old Valentine/Victory stock, and fitted with Canadian clips and nibs. They are uncommon, especially in good condition. They are imprinted "Vacumatic" only. (12) Candy Stripe in Green. The picture shows the Junior model. See above for model comparison. (1-5), opaque versions, also come with the Vacuum Filler imprint. There are several different Black finishes. (5) A Demonstrator. This model was not for sale, only used by sellers to demonstrate the filling sýstems. (7) The Striated Transparent Black, this finish was offered at the same time as the Golden Web. (17) Egg Shell Pale Yellow and Black. The Egg Shells are probably pre-production trials and are rare. Especially the red one. Parker used the Golden Arrow name only to test market the pen. In the Parker archive is the end of a pen box marked Golden Arrow. The pen contained in the box was made in England (but not by Parker) and was a button filler. 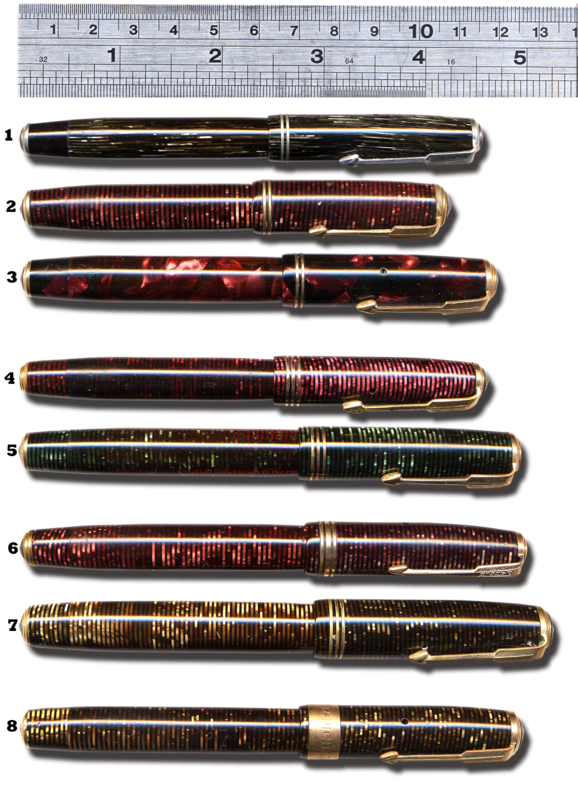 No date has been established for these pens, but it is quite possible that Parker was concerned with trademark infringement, even though, as an extra twist the English Golden Arrow bears a striking resemblence to the Duofold. A combination of the first alternatives is perhaps the most probable. Because this new pen had a revolutionary new filling mechanism, as well as a striking new exterior, the marketing department may have had trouble deciding whether to market the pen based on its form or its function. Function ultimately won out, and the pen became the Vacuum Filler. Although it has been said that Kenneth Parker objected to this decision. he Golden Arrow was never advertised and the first national advertisement for the Vacuum Filler appeared in March 18, 1933. Most Golden arrows have the 1932-1933 Vacuum Filler nib (right), the one to the left is the 1932 extremely rare arrow nib with the arrow soldered on top (approximation). Demonstrator was not really a part of the line, but was produced in transparent plastic to allow the sellers to demonstrate the new filling system. Most Golden Arrows that have survived have Vacuum Filler nibs, one nib exist with the imprint "Golden Arrow", another has a separate gold arrow soldered on top of the platinum plated nib for a 3D-appearance, some nibs have a large gold "V", pointed towards the tip, some again came with Duofold nibs. Very few demonstrator items exist. t this point the sizes didn't actually go by the names Junior and Standard of the later Deluxe/Economy lines, these references came later, they have been used for collecting purposes only. Both the Golden Arrow and Vacuum filler exist in many variations, not subsequently found in the Vacumatic line. There are items with a one piece barrel-section assembly, while most are in two pieces. They exist in both red and white gold trim on black pens alike. Sizes also vary. Items have been found only 109 mm long when closed while others are equivalent to the later 112 mm sub Juniors etc. 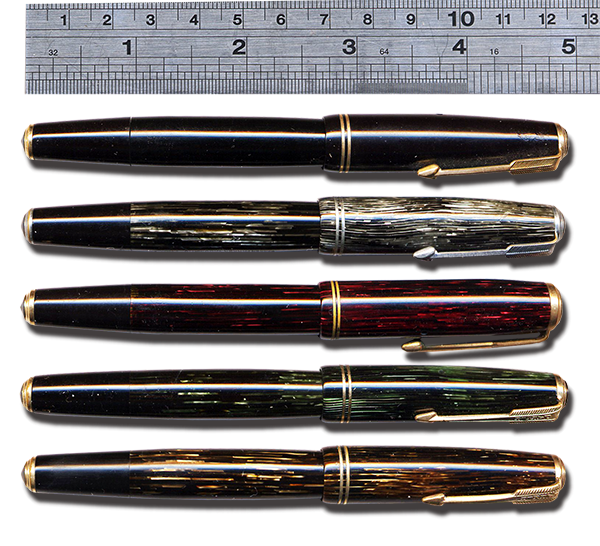 Since the Deluxe/Economy, (or Top line/Bottom line – see below) differency is not applicable, there are in fact bottom-line style pens with top-line style three rings and vice versa. They do come with the lock-down filler, striped sections, striped or black jewels. Some have top rings, rather like the earlier Duofolds, notably the "Stub" pens, while most have the new arrow clip. Very few Golden Arrow pencils have been found, but these are in most respects similar to the later (pre 1935) Vacumatic pencils, with the addition of the Golden Arrow imprint. The Golden Arrow was only produced for five months during 1932 and was only manufactured to test the market. Hence a Golden Arrow is a rare find indeed. (1) The so called "Vacufold". A Slender Duofold Vacumatic, with a Vacumatic imprint, and an arrow clip. (2) A Canadian Slender with a broad solid gold cap band. See also Lockdowns. (3) Slender Junior "Debutante" with ornamented cap band in shadowwave. (4) Slender Junior, "Sub Deb", with a thin cap band. (6) Senior Debutante, blue diamond, ornamented cap band. (7) Short Major. Art deco cap band, blue diamond. (8) Long Major. Art deco cap band, blue diamond. This pen is often being sold as a Slender Maxima (see below). It is not. Note the difference in the size of the cap band. Also, the Slender Maxima has a larger nib. (9) Streamlined Slender. Identical to the Senior Debutante, but with three cap bands. (10) Streamlined Standard. Identical to the Long Major, but with three cap bands. Also this pen is sometimes being sold as a Slender Maxima. It is not. (11) Slender Maxima. This is the true Slender Maxima. A broad cap band, and with a large two-tone nib (see below). (12) Senior Maxima. The Big Boy of the Speedline Vacumatics. (13) Senior Maxima with "Vacumatic" cap band. This model was only sold for a short time, the cap band was then replaced with the style of the one above. hen the Vacuum Filler was issued, an insert was added to the products catalogue. The Vacuum Fillers also exist with two or three cap bands and with either a clip or a ring top. the latter was not really a part of the line, but was produced in transparent plastic to allow the sellers to demonstrate the new filling system. The Grey pens had nickel trim, other colours sported gold-filled trim, a feature that was to follow the subsequent Vacumatic through it's lifetime, although some very rare Vacuum Fillers exist with "opposite" trim. n June 1933 also the name "Vacuum Filler" was discontinued, the name didn't have the right chutzpah that Parker was looking for, someone suggested that it too much resembled a certain household appliance, and the "Vacumatic" imprint was adopted. he marketing of the Vacumatic proved successful, and by the end of 1933 Parker sales had increased by 32%, as the company launched a major sales campaign. That year, Parker spent almost half of the money that went to advertise pens in the United States. By the next year, Parker had ads in seventeen national magazines, 155 daily newspapers and 226 college newspapers. Throughout the 1930's Parker marketed its premier line of pens not only to businessmen, but also to students, assuming that those who could afford college education's could afford relatively expensive pens. In one of their early ads for the Vacumatic, Parker explained "Why the Sacless Vacumatic Will 'Take You Places' in Learning and Earning." Similarly, they enlisted Ripley's "Believe It or Not" to conduct a "widespread inquiry among students," which, not surprisingly, found an "overwhelming preference for this revolutionary Parker Vacumatic." arker's innovation and marketing paid off particularly well. 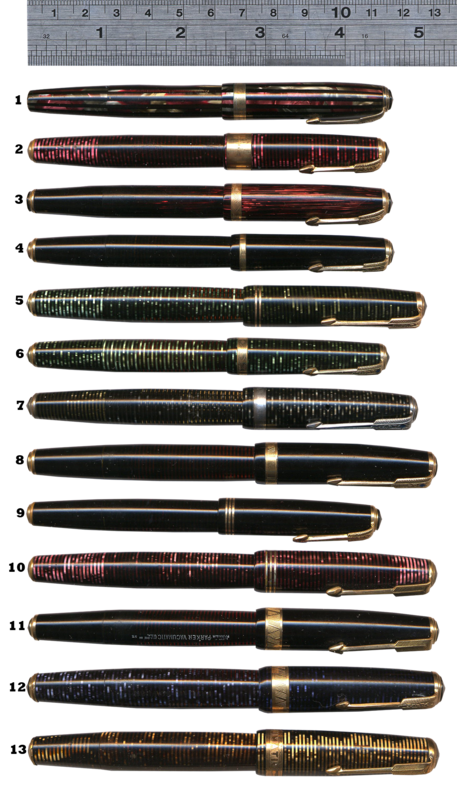 The Vacumatic instantly rose to popularity and within a few years reinstated The Parker Company as the top pen manufacturer after the decline of the then somewhat dated Duofolds. Parker decided to stay with the striped design, allthough a few rare items in other colours and design exist. The Bottom Line of the Vacumatics were cheaper and did not have the lifetime guarantee of the top line, still, in many ways I find the bottom line to be more attractive than the top. The Top Line had quite a few models but stayed essentially the same, striped, in design, only colours varying. The Bottom Line, on the other hand, was presented in a wide variety of colours and designs over the years. These didn't have the famed Vac arrow, which looks rather odd. Nor was it in two-tone platinum/gold, but in gold only (the latter a feature that was to remain with the bottom line throughout its lifetime). The two jewels (clipscrew and tassie) were made in black only (while the top line followed the pens colour and design). Demonstrator pens exist. The more common transparent pen is however not marketed Demonstrator. An 1934 advertisment actually depicts the Crystal as "Transparent Black", but in the products catalogue from the same year it is advertised as being part of the line under the model name Crystal. It was not offered as a Sub Junior. "True" Demonstrators have the additional imprint. Images © the Parker Archives, courtesy of Dan Zazove, David Nishimura, Martin Smith, Mark Ashton, and Eric Wilson. Black opaque, Black Windowed, Black Transparent, Black pencil, Grey Opaque,Grey Tramsparent, Grey pencil, Grey opposite trim, Oversize Holy Water sprinkler, Red opaque, Red transparent, Red pencil, Red with greek cap band, Green transparent, Green pencil, Brown transparent, brown pencil, Green Candy stripe, Red Candy stripe,m Brown Candy stripe, Red Overmax, Green with major style cap band, Black with 14c broad cap band. t this time there seemed to be two features that sold pens: the amount of ink that the pen could hold, and the possibility to actually see how much ink that was left in the pen. Parker now introduced the transparent laminated Vacumatics. The transparency was achived by DuPont by replacing the black plastic on the body with a transparent plastic. This allowed the user to simply hold the Vacumatic to the light in order to see how much ink was left. 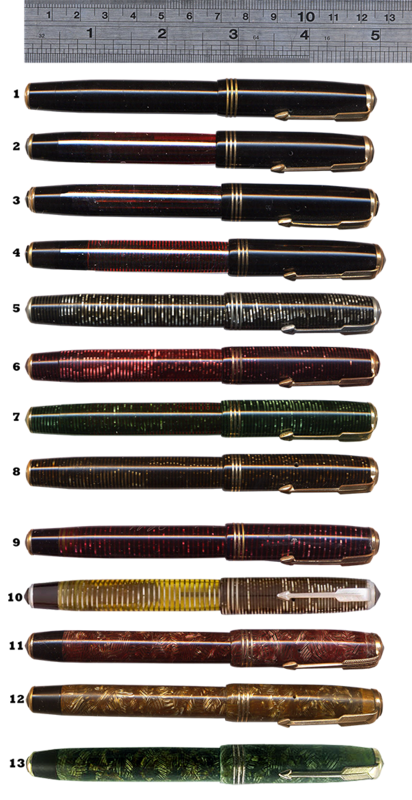 The transparent versions became so instantly popular that all opaque pens were discontinued in august 1934 Interesting statistics show that of 68 sold Vacumatics, 37 was of the Junior sizes, 30 of the Standard and Slender sizes and 1 was an Oversize. In 1934 two more models were introduced in the Top line: the Oversize and the Slender, the Sub Junior was replaced by the Junior Slender, a slightly longer and thinner ladies pen. The stripes was also discontinued on the Bottom Line, it was replaced by an attractive transparent marble design. Image courtesy of The Parker Pen Company Archives. Kenneth Parker's personal Vacumatic in experimental colours. Ca 1933. *Transparent Black. This pen actually had "windows" on the pen running lengthways showing the amount of ink left in the pen [top]. Unique for this year only. **Demonstrator pens exist but the Junior demonstrator was advertised as being part of the line under the model name Crystal. It was not offered as a Junior Slender. ***For some reason it seems that the Slender was not manufactured in Opaque Black. y 1935, Parker were selling 325,000 units annually, a figure that levelled off through the depression and into the war years. The Vacumatic and the saturation advertising campaign that supported it touched off a craze for vacuum and piston filling pens, as other companies scrambled to develop their models, none of which were as durable as the Vacumatic. 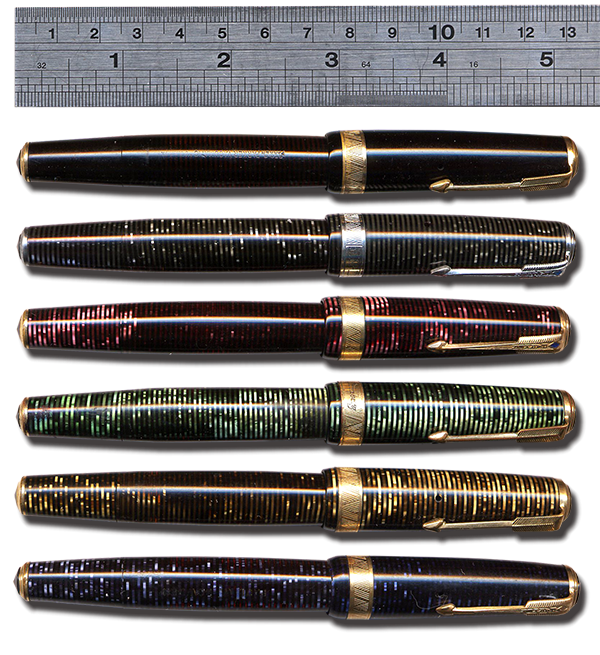 Sheaffer whose sales held steady at about $7,000,000 into 1931, entered the market with its Vac-Fill models in 1935 and added a visual feature a year later. Waterman's Ink-vue model was also introduced in 1936, and Eversharp followed in 1937, trying to beat its competitors with Safety Ink Shutoff, which the Federal Trade Commission forced the company to withdraw the next year. In 1935 the Crystal was discontinued in the Bottom Line and replaced with the same black transparent "windowed" design as previous of the Top Line. A few months later the very same Black Transparent design was discontinued in the Top Line and was replaced by an ordinary Transparent laminated Black. From this point on all Vacumatics have the transparent feature. While the green Emerald Pearl was introduced in the Top Line the Emerald Green Marble was added to to the Bottom Line. *The Black with longitudal "windows" was replaced by an ordinary laminated black. **The opaque black was replaced by the laminated black with the longitudal ink-vue windows. n 1936 Parker advertised the Vacumatic for the same amount of money spent by all other pen manufacturers in the US combined. A new addition was made to the Top Line, The Senior (14 mm Wide, 135 mm Long). It was very much a more slender version of the Oversize. Interestingly enough it was fitted with three cap rings, like all the other Top Line pens, but the middle one was wider, much like the 1932 style Duofolds. The new colour brown Golden Pearl was also added to the Top Line. Two new designs was added to the Bottom Line. The first was a black model referred to as Black Reticular, it was of a design not unlike the Canadian Televisors from the mid 1930's, but while the Televisor was of a pattern with a coloured bottom and black lines "scribbled" all over, the Black Reticular was the other way around, the bottom colour being black. This is a very rare pen but often overlooked due to its but subtle beauty. The other design was the famous Golden Web that was of a golden brown colour designed in an intricate system of tile-, or brickwork. Each tile surrounded by a black line (transparent amber). Both these new pens had black blind caps, as opposed to the other designs that followed the colour of the body. This nib style was to stay with the Vacumatics until the end. *The Junior Slender Golden Web was actually longer than the "ordinary" Junior Slender Vacumatics. A collection of all the Parker golden webs: Pencil, Long Slender Junior, Slender Junior and Junior. A Superfine, Rigid, Long nib. The nibs were of the standard size only, except G and H that was also made in the slender size. All these nibs are rather rare. y the late 1930s, the fountain pen had completed its technical development, and design became increasingly more important than innovation in marketing fountain pens. By then, Art Deco had given way to another industrially based design, generally referred to as Streamline or Streamline Moderne. That style, put simply, rounded the edges of Art Deco. Sheaffer became the first to use this design in pens with the introduction of the "Balance" models. Even Parker's revolutionary Vacumatic had squared edges which were smoothed only in 1937. Waterman's waited even longer. Their elegant, but blocky, Patrician enlargement was replaced only in 1939 by a dramatic new Hundred Year Pen, manufactured entirely out of translucent celluloid. The pen was accented by a highly futuristic streamlined and ribbed design accented by liberal use of gold trim. The same year, Sheaffer set another new trend with the introduction of its Crest model, which featured gold-filled and white metal caps. A year later all these new pens were of course scooped by the introduction of what would come to be the most popular pen in history, the Parker "51". n 1937 Parker decided to change the style of the Vacumatics. Following the recipe of the Duofolds, Parker started to produce a more streamlined version of the Vacumatic (the Standard and the Slender however remained "square" until their last year, 1939, when they also were streamlined). The Twist fill was replaced with a new style plunger, only difference was that it didn't lock down. It was still made out of aluminium. The blind cap was lengthened to fit the new plunger and the new filling system was named the "Speedline" fill by Parker. The story was that the new filler could be operated with one hand, and therefore was quicker. Another truth was that the Twist filler was prone to breakage and was difficult to repair. he Oversize was replaced with a streamlined version called the Senior Maxima (16 mm Wide, 139 mm Long). This entirely new pen had a wide cap band (app 5 mm) initially with a very attractive engraving with "VACUMATIC" in raised letters on the cap band, these models are quite rare. Later the band was engraved with a pattern of repeated lines leaning left and right: ///\\\///\\\. The unequal banded Senior met with an untimely death and was replaced with the Maxima a more slender version of the Senior Maxima. he third new model was destined to become the best seller of the Vacumatic line, the Major. It was identical to the streamlined Standard Vacumatics of 1939, only with a cap band in the style of the two Maximas. The Slender was also streamlined. The Bottom Line mostly stayed the same but the Junior Slender was renamed Juniorette. he reorganisation of the Bottom Line took place in 1938. All marble colours were discontinued and replaced by a new design referred to as the Shadow Wave, it was a pattern of wavy, broken, longitudinal lines set on a black (transparent) background. The Black Reticular and the Golden Web were discontinued although the feature with black blind caps survived into the Shadow Wave line. The Bottom Line was still not streamlined. Also in 1938 a new model, the Junior Debutante was offered. It was approximately 118 mm long and 12 mm wide. The clip was still like the normal "archers arrow" introduced in 1932 but had the additional engraving "Parker" inside an elongated "V" running down almost to the tip of the arrow, this was in fact the clip later adopted to the Vacumatic filled Parker 51's. The Junior Debutante had a short clip (app 25 mm) as opposed to the "normal" clip (app 34 mm). It also had an engraved cap band (app 3.5 mm) with a pattern of repeating chevrons and diamonds, this pattern was later added on some of the gold filled and sterling silver caps of the Parker 51.
n 1939 the Bottom Line was restyled in the manner of the Top Line in 1937. The pens became more streamlined and adopted the new Speedline filling system . The new "Parker" Arrow clip was fitted to all Vacumatics, including the Top Line. The Junior Debutante was renamed Sub-Deb and the engraved cap band was narrowed to approximately two mm with no engravings. he Junior Debutante style did in fact live on but in 1940 actually moved up to the Top Line in the form of a model called Debutante the difference being the design (the Top Line Debutante, aka Sr Debutante, was produced in laminated plastic and the Jr Debutante was made in the Shadow Wave design) and the addition of the Blue Diamond to the Sr Debutante. In the Top Line the Standard and the Slender became streamlined. 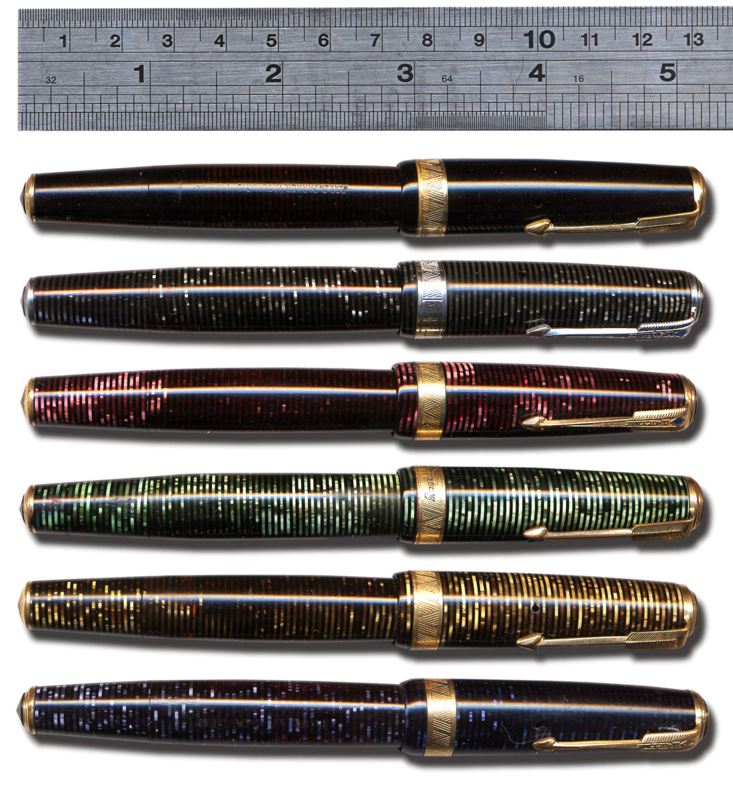 During the late 1938 and 1939 a few pens appeared with a new clip later referred to as the "Parker Arrow" clip, this was a new style clip to come but these early pens had one distinct different feature: a small star with five points on top of the clip, just below the clip ring. The star was meant to be a mark of lifetime guarantee, but for uncertain reasons was discontinued and replaced by the now famous Blue Diamond. A few things has been suggested as the reason for the discontinuation of the star: It was too difficult to produce, being so fine lined; the foreign markets were important to the European subsidiaries, not the least Germany and this star was not unlike the Jewish David's star; or the star was simply not a good choice for advertising reasons, since it was too fine and would be hard to use in photographic ads. Another theory is that the star clip pens were meant for army use, to state Top Line pens, but without life time guarantee due to conditions too rough. For any reasons, the enamelled Blue Diamond was a better choice. Leaving the star clip as a rare addition to anyone's later day collection. The new Parker Arrow clip first appeared on the Junior Debutante model in 1938 but was fitted to all Vacumatics in 1939 The Top Line also had the Blue Diamond design, which ensured lifetime guarantee for it's original owner. All sections, previously following the colour of the body, became black. Ditto for the clip- and tassie screws. Imperial Major Signet like the Senior Maxima but with trim in solid gold. The Imperial Lady Signet like the Slender Maxima but with trim in solid gold. The Imperial Signet like the Major but with trim in solid gold. The Imperial Debutante Signet like the Debutante but with trim in solid gold. The Imperial was like the Major but with a gold plated cap (much like the forthcoming Parker 51 only these pens had a screw-on cap and a threaded section in the pens colour. The Imperial Debutante was the same but in the Debutante style. 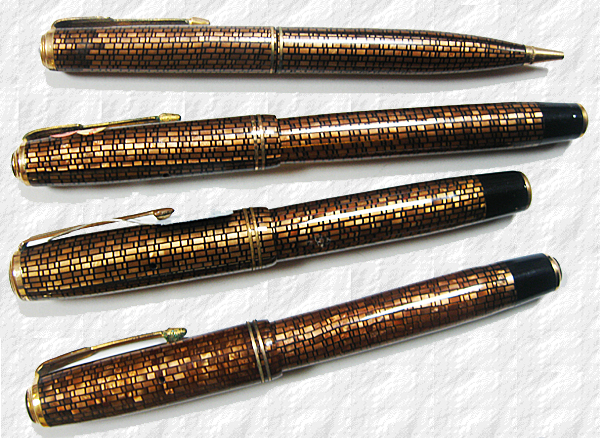 These pens were offered in Black and Golden Pearl only. Imperial Princess, the same but Debutante. A very rare model called Imperial Coronet in solid yellow and green gold was also produced. he streamlined Standard pen was discontinued in 1940 and the Major filled the gap. (The Major is in fact referred to as the "Standard" by many collectors). The Slender was also discontinued and replaced by the Debutante, it was very much like the Junior Debutante but was fitted with the Blue Diamond and had the two-tone nib. The Maxima was appropriately renamed Slender Maxima but stayed unchanged. In the Bottom Line the Shadow Wave colour was discontinued and they all adopted the laminated colours except the burgundy. This was probably because Parker already had planned to stop producing the burgundy in the Top Line, as they also did in 1941. In 1941 a new colour, the Transparent Azure Blue, was introduced in both lines and the Burgundy Pearl was discontinued. Also the Senior Maxima was renamed Maxima in fact Mark II, to distinguish it from the slender, late 1930's model. The Imperial Signet, the Imperial Debutante Signet, the Imperial Ensign and the Imperial Princess were all discontinued. In 1942 came the last of the Vacumatic filling systems, in all respects like the aluminium Speedline fillers, but since the metal was now needed for war purposes the 1942 plungers were made out of plastic. At the same time the blind caps were redesigned became rounded and lost their tassie rings and jewels. 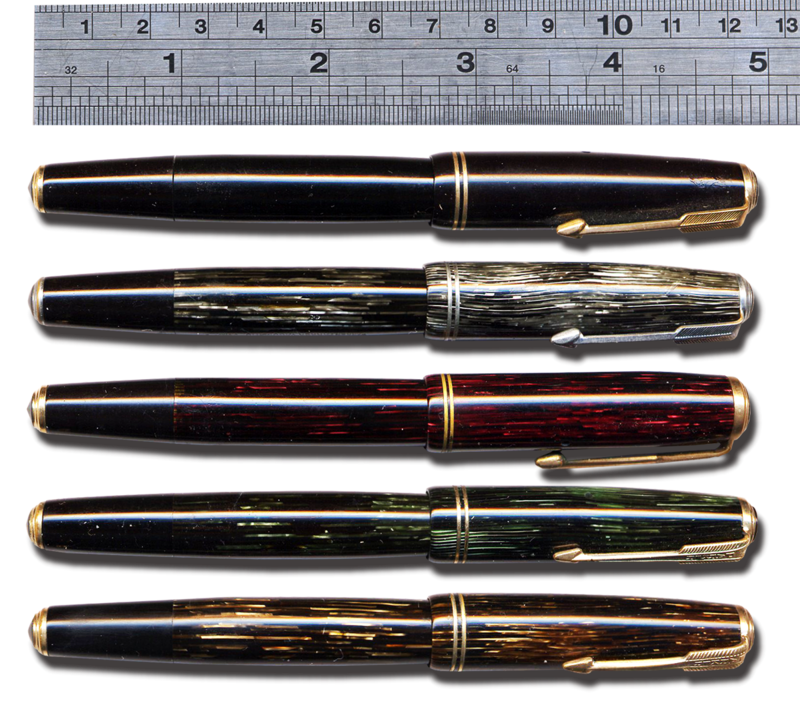 Some pens exist, made in the transition, with aluminium plungers inside rounded blind caps. The cap band of the Maxima was narrowed to the same width as that of the Major (app 4 mm). Before 1942 the Slender Maxima and the Major was virtually of the same size, the difference being the wide cap band, and most important, the nib size on the Slender Maxima. The feed usually has the "W" for wide feed imprint. In 1942 the bottom jewel disappeared and the plastic plunger was added, also the wide cap band on the Maxima was narrowed to approximately 4 mm. The Slender Maxima was discontinued. The 1942-1946 Major (with rounded blind cap) is in fact quite shorter than the earlier (two-jewelled) version. The Vacumatic line underwent no further changes and was phased out in 1948 since it was outsold by the incredible Parker 51. Production of the Vacumatic did however continue in Canada until 1953. The Canadian Vacs differed in some ways from the US-made ones.